Many international film festivals feel understandably compelled to both fulfil their missions as showcases for world cinema and cater, as best they can, to the needs of the local community. It goes without saying that national cinemas crave attention from their flagship festivals – even though the public is in fact often oblivious to local offerings and may instead flock to commercial or auteur favourites from climes far from the host country. This quandary, which reflects the split identities of many events from Toronto to Istanbul, was certainly apparent at the 2006 edition of the Thessaloniki International Film Festival. Many of the Greek premieres of films that have already received considerable attention on the festival circuit – Tsai Ming-liang’s estimable Hey yan quan (I Don’t Want to Sleep Alone, 2006) as well as Darren Aronofsky’s ludicrous The Fountain (2006) – attracted large crowds while the Greek films, highly touted in the official literature, were often sparsely attended. A decidedly lacklustre response to national cinematic cheerleading is a common occurrence throughout the world – the international press, for example, studiously ignores many of the Canadian features, whether worthy or execrable, at the Toronto International Film Festival. The out-of-town critics who travelled to Thessaloniki seemed similarly disinclined to attend the numerous local films on display – not an entirely irrational decision in light of a few of the more dispiriting movies included in the hefty selection of recent Greek features. The general impression I garnered is that Greek cinema is languishing as it suffers from a temporary creative slump. Yannis Economides is, to cite a prototypical example, considered one of the few cutting edge Greek directors; his earlier feature, Spirtocouto (Matchbox, 2003), was hailed as breakthrough movie. Slightly over-hyped, Matchbox was nevertheless an intriguing provocation and something of a reprimand to the more genteel conventions embraced by many of Economides’ compatriots. Yet while Matchbox seemed like a breath of fresh air, his latest film, I psihi sto stoma (Soul Kicking, 2006), touted as a merciless portrait of a man besieged by overbearingly abusive relatives and employers, is merely monotonous. There was something bracing about Matchbox’s vulgarity. Unfortunately, Soul Kicking’s staccato, unremittingly profane dialog, comes off as an exercise in sub-David Mamet verbal pyrotechnics. Another Greek entry, Dimitris Stavrakas’ To perasma (The Crossing, 2006) while admittedly directed with less assurance that Economides’s psychodrama, at least dealt with a substantial political dilemma (the plight of illegal immigrants in Greece) and could be termed something more than a gratuitous stylistic exercise. Stavrakas’ version of neorealism is crude indeed (the director trained as a sociologist; his film is more akin to a bloodless case study than a vibrant piece of cinema) and his cast of mostly nonprofessionals turns in consistently wooden performances. Yet, this tale of a Bangladeshi named Jaheed who dreams of a blissful life in Greece with his fiancé and makes a disastrous attempt to flee crushing poverty, is compelling despite the distinct lack of artistry on display. The Greeks Jaheed encounters in a series of odd jobs are occasionally empathetic and sometimes unfeeling and xenophobic. But Stavrakas is less interested in condemning, or apologising for, his compatriots than in outlining the grim circumstances that befall many immigrants whose valiant efforts to earn a livelihood end disastrously because of systemic, not personal, factors. While recent Greek cinema may be less than scintillating, Thessaloniki’s Balkan Survey included some of the festival’s most noteworthy entries. The question of whether cinematic traditions from countries as disparate as, say, Turkey and Romania can actually be wedged into the somewhat amorphous category known as Balkan Cinema still fuels furious academic debates. As it happened, however, Turkey and Romania produced some of the more stimulating films to be screened in the Balkan Survey. Nuri Bilge Ceylan’s portraits of urban anomie have been rapturously received in recent years. Reha Erdem appears destined for an equally illustrious career – even though his Bes vakit (Times and Winds, 2006) explores vastly different terrain – an isolated corner of rural Turkey rarely viewed by tourists – with equally impressive results. (Ceylan himself was honoured with a retrospective at the festival.) From a purely cinematic vantage point, Erdem’s film is straightforwardly dazzling. Florent Herry’s widescreen cinematography captures the austere beauty of a mountainous village and Arvo Pärt’s hypnotic music, alternately mystical and sensual, is brilliantly effective. Erdem charts the growing pains of three teenage boys in a small community dominated by the life of a mosque. Two of the boys have difficulties controlling parricidal fantasies: Omer, the son of an imam, can’t stand his tyrannical father while his pal Yarkup resents his father’s prurient obsession with the local schoolteacher. This harrowing view of hardscrabble life in the pitiless countryside at times resembles a Turkish version of the Taviani Brothers’ Padre Padrone. But Erdem’s touch is considerably lighter; the melancholy realities of being poor and isolated are leavened with generous doses of humour. Given the international plaudits heaped on Cristi Puiu’s Moartea domnului Lazarescu (The Death of Mr. Lazarescu, 2005) and Corneliu Porumboiu’s A fost sau n-a fost? (1208: East of Bucharest, 2006, also screened in the Balkan survey) at Cannes and Toronto, Romanian cinema seems on a roll. 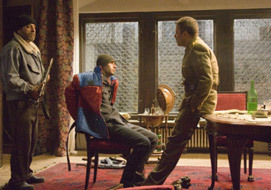 In addition, the presence of a short film (Tertium non datur, 2006) by veteran director Lucian Pintilie reminded viewers that the current Romanian wave did not emerge from a total cinematic vacuum. In keeping with Romania’s ongoing reassessment of the Ceausescu regime, Radu Muntean’s Hirtia va fi albastra (The Paper Will Be Blue, 2006) depicts the tragicomic confusion engendered by the 1989 revolution. Viewed through the prism of a chaotic occupation of the national television station by anti-Ceausescu militants, the bulk of Muntean’s subtly astringent commentary is filtered through the misadventures of Costi, an earnest militiaman who sides with the democratic forces. The resulting pandemonium makes it difficult to distinguish partisans of the old regime from rebels and the hapless Costi does his best to convince sceptics that his heart is indeed in the right place. The gently absurdist tone would have pleased the late, Romanian-born Eugène Ionesco, absurdist par excellence. Daily life in post-Communist Romania can be equally disorienting and Cristian Memescu’s touching short Marilena de la P7 (Marilena from P7, 2006) provides a mordantly humorous look at the ravages of free-market capitalism. A young boy, alienated from his parents and school, becomes infatuated with a local prostitute and hijacks a bus in a misguided attempt to impress her. Memescu fleshes out this seemingly inconsequential vignette with vivid scenes of a squalid apartment block and melancholy glimpses of hookers on the stroll. Slawomir Fabicki’s O zdzysku (Retrieval, 2006), a noirish Polish melodrama, is similarly concerned with the rot of corruption in a former Communist country; the lure of the cash nexus in a capitalist society gone berserk proves as oppressive as the bureaucratic state socialism that preceded it. An airless, relentlessly deterministic narrative, Retrieval graphically illustrates the way in which the black market and the underworld have taken the place of the Party in post-Communist Poland. The rather predictable saga of Anton Pawlicki, a 19 year-old smitten with a fetching Ukrainian immigrant who quits his factory job and finds work as a hired gun for a brutal loan shark, is an unsparing indictment of Polish corruption that might well have been titled No Way Out. The brackish colour scheme, and near-documentary aesthetic, may bear a superficial resemblance to Andrzej Wajda’s stylistic repertoire. But Wajda’s films still belonged to an altruistic strain of social commentary and Fabicki’s crudely effective shocker allows little room for even provisional hope. A considerably cooler sensibility predominates in Bülent Akinci’s Der lebensversicherer (Running on Empty, 2006), a German film that conveys a disgruntled insurance salesman’s despondency with deadpan humour. Akinci’s tendency to poeticise the mundane – filling stations, anonymous roadside pit stops – is something of a throwback to Wim Wenders and Peter Handke’s preoccupation with the detritus of modern life. But while Running On Empty’s anti-hero, Burkhard Wagner, is a latter-day Bartleby who “prefers not to” prolong the agony of his dead-end job, we are not even offered the hard-won epiphanies proffered by Wenders and Handke’s ‘70s classics. A roadside encounter with a lonely woman, who offers Wagner some solace in her secluded motel, results in just another narrative cul-de-sac. The Homage to Brazilian Cinema section assembled a laudable assortment of certifiable classics – e.g. Glauber Rocha’s Terra em Transe (Land in Anguish, 1967), Nelson Pereira dos Santos’ Vidas Secas (Barren Lives, 1963) – and recent art house hits – e.g. Cidade de deus (City of God, 2002), Cinema, Apirinas e Urubrus (Cinema, Aspirins, and Vultures, 2005). For those in search of the less tried and trued, a sidebar devoted to New Chinese Cinema was perhaps Thessaloniki’s most ingenious retrospective. The decision to focus on commercial films with explicitly urban themes by young directors (almost all of whom are unknown in the West) challenged filmgoers’ expectations with admirable aplomb. In a panel discussion attended by many of the highlighted directors, Variety critic Derek Elley, the retrospective’s curator, maintained that the knee-jerk propensity of festivals to screen either historical spectacles from the likes of Zhang Yimou and Chen Kaige or rarefied art films by Jia Zhangke overlooked a vital component of the Chinese film industry. It’s of course undeniable that even the most likable entries in New Chinese Cinema – e.g. 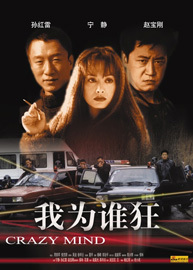 Chen Daming’s Jing gai’er (Manhole, 2003), a fast-paced gangster film that addresses the moral vacuity of the newly rich and Zhou Xiaowen’s Guanyu ai de gushi (The Common People, 1997), a compassionate study of a disabled woman’s struggle to aid an injured friend, pale in comparison to Jia’s seminal work. But, these gutsy genre films, by no means masterpieces, are fascinating attempts to hold a mirror up to the inequities of Chinese society – the equivalents perhaps of Warner Bros. B films or less preachy incarnations of American social conscience movies of the 1950s and ‘60s. Innovative programming on the order of New Chinese Cinema, tailor-made for omnivorous cinephiles, is what continues to make Thessaloniki worth a special trip. The Independence Days section – expertly curated by Lefteris Adamidis and replete with worthy entries such as Valeska Griesbach’s Sehnsucht (Longing, 2006), Abderrhamane Sissako’s Bamako (2006), So Young Kim’s In Between Days (2006) and Kelly Reichardt’s Old Joy (2006) – stood out as a distinguished festival within a festival. Disappointing Greek films notwithstanding, Thessaloniki continues to be a consistently adventurous event that occupies a vital space on Europe’s festival calendar. Richard Porton is a member of Cineaste’s editorial board and the author of Film and the Anarchist Imagination (Verso).